If you have previously had a bad reaction to bee stings you must seek medical advice. We all know that bees sting. However, bees are not normally aggressive and only sting when provoked, when they feel they are in danger or that the colony is under threat. A worker honeybee will die after stinging. A honeybee will usually give warning, often buzzing threateningly around your head, or "head butting" you. Do not flail around or try to swat the bee away. Quickly and quietly, walk away. Bees do not reserve this behaviour for humans; it works equally as well with wasps, bears, badgers and elephants. This defensive behaviour has allowed bees to survive for millions of years. If you have been stung and you can see the sting, all you can do is try to minimise the reaction. Much of the bee venom will have been injected immediately but the sting will still be pumping venom into you. Do not pull the sting out, but instead scrape it out as soon as you can, avoiding breaking the venom sac. Do this while walking away; the sting broadcasts a pheromone to other bees, telling them that you are a threat. If you stay put, you continue to be a target. For most people, a bee sting is very painful; but on the bright side and unless you are in the small minority who suffer severe reactions, some people believe that bee stings can reduce the threat or severity of arthritis, and dried, concentrated bee venom powder is much sought after by the cosmetics trade and sells for up to �27,000 per ounce. Meanwhile, the venom in the sting will cause you pain, redness, swelling then itching. Stings in the face or neck can be distressing. Stings in the nose, ear, mouth or eye can be serious; if this happens you must seek medical advice as soon as possible. Generally, swelling can be reduced by applying ice if it is available. Bicarbonate of soda, being alkaline, is said to reduce the acidity of the venom but this has not been proved. Antihistamine or hydrocortisone cream can reduce itching although some people have a sensitive reaction to these. Very occasionally, the reaction can go beyond pain, swelling and itching. Sometimes people with no previous severe reaction to stings can become over-sensitive. Allergic reactions can range from mild to extremely severe. If you experience itching elsewhere on the body other than the site of the sting, wheeziness, nausea, giddiness, difficulty in breathing, stomach pain or any other unexplained symptom, you should call an ambulance. Left untreated, the reaction could develop into full anaphylaxis which is life threatening. Anaphylactic shock happens fast and is a life threatening allergic response. The body reacts to the allergen by producing excessive amounts of histamine. This makes blood vessels dilate throughout the body, which leads to a dramatic drop in blood pressure. The sufferer loses consciousness, the blood circulation and heart can stop and without immediate emergency treatment this leads to death. Anaphylaxis is very rare but must be taken very seriously. Please click here to learn what to do in the event of anaphylactic shock. Knowing how to deal with the situation can save lives. 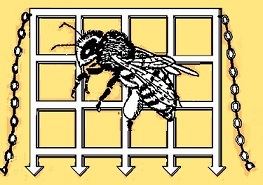 If you are a beekeeper let people know when you are going to work with your bees and when you will return. Always carry your mobile phone, fully charged, and keep it to hand when you are working. If you get into trouble you can dial 999, and even if you cannot speak they will be able to trace you. Have an ICE number on it ("In Case of Emergency" - a number that the emergency services can contact). If you can speak, be able to tell the operator where your apiary is - sometimes not as easy as you think. If you have been stung walk away from the bees. If you can, go into a building or car, or a heavily wooded area. The bees will fly towards light. Call 111 to ask for medical advice if you experience anything more than pain; 999 if the reaction is causing concern at any level, or the sting is in your ear, nose, mouth or eye, or if you are known to have a severe reaction. Do not hesitate. If you have an "EpiPen" always have it with you and let others know that you have it. If you are with someone who has an "EpiPen" make sure that person tells you how and when to use it in the event of a sting. If you come across hives you can stand at a distance and admire the bees as they come and go but they will be following a flight path. Avoid standing in their flight path. If bees approach you buzzing loudly, they are asking you to walk on; your best option is to take their advice.